Looking for an Office Water Cooler? 1. What are your options? – Bottled water coolers – water in 5-gallon jugs delivered via truck. 2. Which water cooler style works best for your office? – Strength available to change 42 pound bottles. – Time to spend reviewing variable rate water invoices for accuracy. – A dedicated resource to monitor inventory and reorder as needed. – A resource to clean your water cooler every 3 months with the recommended bleach. – A water source somewhere in your building. – An electrical outlet within 6 feet of the planned location. Capacity is determined by the ability of the cooler to chill an adequate volume of water, so you’ll need to have an estimate of the demand in your office (i.e. number of employees).For a bottleless cooler, knowing the volume of users will be all you need to determine the correct size cooler. For bottled water cooler, you’ll need to pick the size of the cooler and determine how many 5-gallon jugs to stock to avoid running out. Selecting a contract type should involve a bit of consideration. You might be uncertain about your water choice or have doubts about how well it will suit your business. In that case, choose a month-to-month option. Scared of even that commitment? Select a trial. Either way, be sure to consider the variety of options each vendors allows. 5. What will this cost? Any business expense merits careful consideration. Are you able to project your annual costs? This is very challenging with bottled water, as demand varies throughout the year. Plain and simple, bottleless water coolers are less expensive. Without overhead for delivery vehicles, truck drivers, and bottle manufacturing, bottleless coolers can cut costs. Bottleless water generally offers a flat monthly rate, making budgeting considerably easier. When selecting a bottleless company, check for maintenance of filter change fees. Some bottleless water providers break up their costs to make monthly rates appear lower than they are. In these cases, maintenance fees can range up to $100, which effectively increases your monthly rate by up to $10 per month. Ask for an annualized monthly rate. 6. What kind of company do you want to work with? The water service industry has many players- big, small, national, local. Sometimes you may receive a lower rate from local firms. However, the tradeoff may be in reliability of service and quality of product – leader to poor water taste and unanswered service calls. Since there is no requirement for testing bottled water quality (filtered water draws from municipal sources which have EPA-mandated testing standards), you’re taking an extra risk with a bottled water provider, particularly a smaller local business. You may pay a higher rate with a larger firm, but as with most things you generally get what you pay for: better equipment, higher water standards, more sophisticated and reliable customer service organizations. Beware of brand-name firms that seem “national” but are actually local “mom-and-pop” franchisees paying to use the national brand name. Regardless of size, water services are dependent on the quality of the local team. Check to make sure the company employs trained service technicians. And check for an A+ rating from the Better Business Bureau – a very good sign of broad quality service. In the end, bottled water coolers often no longer make sense. They’re more expensive, leave a large carbon footprint, and are no more pure than filtered tap water. Yet, many organizations are still use bottled water coolers because they are not aware of the alternative. Using bottleless water coolers provides your employees clean, safe water and can significantly improve your firm’s bottom line. As the largest bottleless water service in North America, Quench serves more than 25,000 businesses – including more than one-third of the Fortune 100. Switching your company to bottleless water cooler service – a step already taken by so many businesses with more and more making the switch each day – will improve your firm’s bottom line via direct and indirect costs, will show your co-workers that the company takes their health seriously, and will have a positive impact on the environment. https://thinkspace.com/wp-content/uploads/2013/11/website-thinkspace-logo-teal-155x69.png 0 0 Alyssa Magnotti https://thinkspace.com/wp-content/uploads/2013/11/website-thinkspace-logo-teal-155x69.png Alyssa Magnotti2011-08-15 08:10:052011-08-15 08:21:27Looking for an Office Water Cooler? 2010 Best Workplace for Recycling: thinkspace Community awarded for second consecutive year! In June, King County named 75 local companies to its 2010 “Best Workplaces for Recycling and Waste Reduction” list – recognizing businesses with exceptional recycling programs and for their commitment to reducing the amount of waste their company produces. This is the second year in a row that thinkspace has been named to this list. I have to say thank you very much to the entire thinkspace community for their daily participation in our recycling efforts. It’s an award that really belongs to our community! https://thinkspace.com/wp-content/uploads/2013/11/website-thinkspace-logo-teal-155x69.png 0 0 Peter Chee https://thinkspace.com/wp-content/uploads/2013/11/website-thinkspace-logo-teal-155x69.png Peter Chee2010-07-29 23:26:222010-07-29 23:48:502010 Best Workplace for Recycling: thinkspace Community awarded for second consecutive year! I just received my Green Festival Seattle Exhibitor Invitation! Last year, Seattle held its first annual Green Festival and it was a huge success. I remember the weather was incredible that weekend as it was about 80 degrees and clear blue skies. I also remember it being completely packed as more than 30,000 people attended the weekend event. I think the 2009 event will be even more successful. Your business: For the best in green, there is only one event against which all other green events are measured. By choosing to participate in Green Festival, your business has secured the best and most comprehensive exposure for your planet- and people-friendly products and services. The community: By offering green alternatives to businesses and individuals across economic and political spectra, you provide them tools to enjoy a healthier way of life. Awareness of your business expands rapidly as neighbors in these regions spread the word. Our planet: When you exhibit your green products and services at Green Festival, you help create a more just and sustainable world. Attendees feel more empowered when they see the daily actions effecting positive change. By employing the ideas, tools and products you provide these motivated citizens help make life better life better for everyone. For more information on how to be an exhibitor you can go the the Green Festival Exhibitor website. The are offering a nice incentive (30% off) to those that register and pay in full by December 15, 2008. This is something that I definitely have to consider doing! I’m really excited about event as last year was so enjoyable! Green Festival Seattle 2009 will be on March 28th and 29th at the Washington State Convention & Trade Center. Hours are: Saturday 10AM – 8PM and Sunday 11AM – 6PM. Click here for pricing. Free Admission Tickets: My wife just told me that you can get a free admission ticket to the Green Festival Seattle if you purchase $5 worth of groceries at PCC. Back during the Green Festival Seattle, I found a company called the Sustainable Group. They sell really cool looking office supplies like the Repocket (shown here in the picture). All of their stuff is made of recycled cardboard! It really makes quite a statement when you put your marketing collateral inside one of these folders. I had a chance to go out to their office over in Ballard and met a few of the people that work there. They were all very nice and were showing me all the different ways to put my company logo on various things like 3-ring binders, folders, CD jackets, mailers, and labels. I even got a few samples of these things to which is always fun. Any business that is making a statement about caring for the environment and has a commitment to sustainability, should be looking at these babies. They are guaranteed to make people go ooh and ahh. Yes, it’s cardboard, but, even that makes me excited compared to the plastic glossy coated junk. Don’t throw your batteries in the trash, recycle them at thinkspace! We are now offering our clients battery recycling. We will accept rechargeable and non-rechargeable, such as D-cell, C-cell, AA, AAA, 9-volt, and button cells. King County offers local communities Recycling Collection Events for businesses and residents where you can drop off reusable and recyclable materials including batteries, appliances, electronic equipment, light bulbs, clothing, as well as vehicle related items. If you are interested in battery recycling services in your area go to Earth 911 for more information. This website offers a recycling search tool which helps you find resources for recycling almost anything! https://thinkspace.com/wp-content/uploads/2013/11/website-thinkspace-logo-teal-155x69.png 0 0 thinkspace https://thinkspace.com/wp-content/uploads/2013/11/website-thinkspace-logo-teal-155x69.png thinkspace2008-10-10 15:34:102009-02-09 12:48:51Battery Recycling at thinkspace! Being in “green” shared office space can help keep your companies operating costs down. Yes, it does cost more to go green, but the payback begins right away. thinkspace has the ability to offer shared office space in a class A shared building and keep the lease rates reasonable. One of the big ways we’re able to do this is because our space is operating more efficiently than before. By going green it helps keep our costs down so that our lease rates remain attractive. 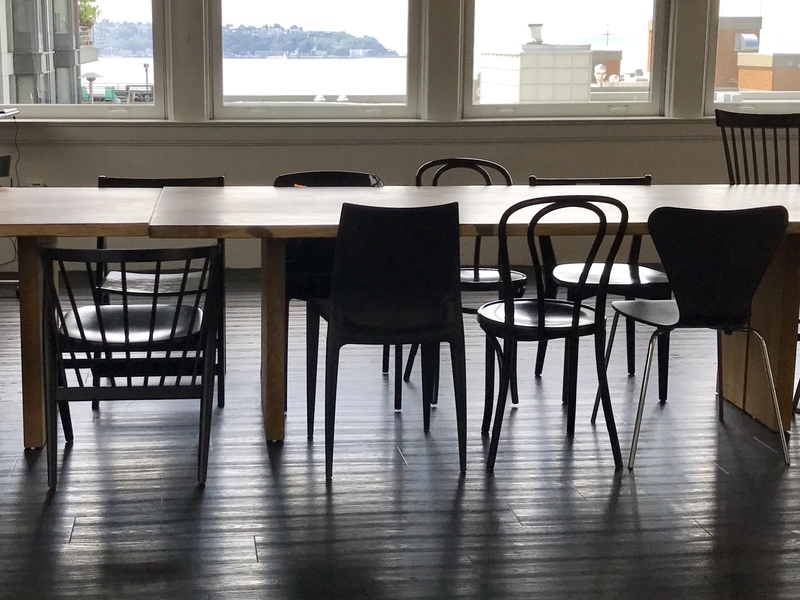 This is something you won’t be hearing from other shared serviced office space providers and executive office suites in Bellevue, Kirkland, Redmond, Sammamish, Woodinville, and even in Seattle. Three years ago, before going green was hot and trendy, I was learning about efficient building envelopes at the King County Master Builders Association, Built Green classes. We made our decision to go green with thinkspace and seek LEED certification for our work space. We wanted to make a significant reduction in our carbon footprint and one way we did it was by reducing our electricity consumption. As part of our LEED certification, we installed commercial energy efficient light fixtures. The model that we used was the aesthetically attractive and appealing Lithonia PWS1836 AVANTE series fixture. This article is a follow up to the the blog post that I wrote called “Energy efficient Commecial Light Fixtures“. In addition to using these light fixtures, we also installed Lutron occupancy sensors in each office and meeting rooms. Even our vending machines have energy misers on the vending machine, which I’m told will save us approximately $150 per year in electricity. I wanted to follow up with concrete facts on our energy consumption since we have completed our build out. I also wanted to show some historical numbers for the last three years so that you can see what a few years of usage looked like before the building went green. For August 2008, we consumed 48,600 KWH compared with 86,040 KHW in August 2007. That’s a 37,400 KWH reduction for the same period a year prior when the building was not “green”. To quantify that in dollars, our electricity bill is $1,841 less! That’s a big 44% reduction in energy consumption. I expected to see a 30% reduction in electricity expenses, but this is definitely exceeding my expectations. “Green is the new black”. That phrase has new meaning to me. Come out and join thinkspace at the EcoCommuting and Sustainable Living Fair at Redmond Town Center on Thursday, August 21st. This event is about celebrating a cleaner, healthier environment. There will be over 20 informational booths showcasing what local businesses and non-profits are doing to support sustainable living. This event is by: Greater Redmond Transportation Management Association and co-sponsored by: Redmond Town Center, Genie Industries, Microsoft, Golder, and City of Redmond. thinkspace will have a team there to show you ways to bring sustainability into your office space. Email me if you want to come join us at our booth: peter [at] thinkspace [dot] com. Volunteers will get an organic cotton team t-shirt. Updated: 8/21/08. A few photos from the event. I’ve done my analysis for which dry erase marker we’re purchasing for thinkspace and we’re going with the AusPen. Before making a purchasing decision, I try and make sure that I read enough about products to be sure I’m not just buying into the “green” hype. I look at the company, their mission statement, and materials that are used to create their product. I was reading the Whiteboard Markers blog and one post states that every year a billion whiteboard markers are thrown into landfills in North America alone. School teachers use about 500 million whiteboard markers each year. A few things make the AusPen unique compared to the Sanford Expo markers that we all grew up using. Firstly, they are refillable. Secondly, they are non-toxic. Thirdly, they are xylene-free, which means you won’t pass out from inhaling the fumes — also good for maintaining indoor air quality. Lastly, they are made of high quality aluminum. I found one competing product, which is definitely an option that I considered. Staedtler makes a product called Lumocolor. It also is refillable, non-toxic, xylene-free. The only difference is that it appears to be made of plastic. The AusPen costs about 2.8x more expensive than the Staedtler Lumocolor. However, the things that moved me in favor or the AusPen was the fact that the aluminum will probably last longer than the plastic and the fact that AusPen has a strong sustainability statement. The AusPen also states that each AusPen is equivalent to 246 regular dry erase markers. The cap of the AusPen can also be left off the pen for 24 hours before it dries out. That’s a huge difference compared to regular dry erase markers. If you’re looking to “green” your office you might want to consider these dry erase markers. I’m looking forward to using these markers with our new whiteboards which are wrapped in natural vertical grain bamboo! We just purchased a “recycled” Baby Planet Unity Sport Stroller. We have outgrown our Snap N Go Infant Carrier and have been shopping around for a new stroller. We first had to choose between tandem or side-by-side. The Snap N Go was a tandem and while I think it is a good product, I think the side-by-side is better for my children as they can sit next to each other a keep each other company. We considered the Peg Prego Aria Twin, Spider Duo, Dreamer Design Double Jogging Stroller and the Baby Planet Unity Sport Stroller. Some of the most important things that we were concerned about was 1) size and weight; 2) durability; 3) price; and for me 4) innovation (I’m a sucker for technology). While out shopping and trying them out we had a hard time fitting some of these strollers into our trunk. That immediately ruled out a few of them. The next thing was price. Some of these strollers are up around $800-900. That ruled out a few more. The stroller that best fit our needs is the Baby Planet Unity Sport Stroller. I don’t think I could be any happier with it. The few cool things about this stroller is that it has a unique “easy steer” handle that allows you to turn this stroller around on a dime. It also is super compact when it folds up. It easily fits into our trunk and we have room for other stuff too! One other big bonus is about the company itself — the company has a strong sustainability statement. They are concerned about the negative impact of having more stuff getting tossed into the landfills. When you’re done with your stroller and have no more use for it. They will either help you find another family that can use it or they will take it back and have the stroller dismantled and all parts will be properly recycled by an accredited recycling company. Is this a coincidence or pattern that my purchasing decisions seem to be frequently aligned with companies that also have a commitment to sustainability? I also need to say that the price of a new Baby Planet Unity Sport Stroller is around $320. For a very in-depth review, I recommend that you read a review by Nancy at the MWS blog. She provides tips about the stroller that I would have never figured out had I not read about it. The reason I like this tool is because it visually shows where all the area ammenties are in relation to your address. When deciding where to run your business you should look for a building that has a high Walk Score. Having a higher Walk Score, can provide local businesses with foot traffic to help sustain their business. As soon as I saw this website, I wanted to see what my Walk Score was for our office space in Redmond. We managed to score a 95 out of 100 possible points. It’s important for businesses to be operating in a building that has high community connectivity. I’m always looking to do business locally with other businesses in Redmond, rather than sending my business off to other cities. 1) Bank; 2) Place of Worship; 3) Convenience Grocery; 4) Day Care; 5) Cleaners; 6) Fire Station; 7) Hair Care; 8) Hardware; 9) Laundry; 10) Library; 11) Medical/Dental; 12) Senior Care Facility; 13) Park; 14) Pharmacy; 15) Post Office; 16) Restaurant; 17) School; 18) Supermarket; 19) Commercial Office; 20) Community Center, and other recognized services evaluated on their merit. Tenant to select building within ½ mile of a commuter rail, light rail or subway station or ¼ mile of two or more public or campus bus lines usable by tenant occupants. I’m very happy with Walk Score and have added their Walk Score Real Estate Tile onto the thinkspace website location page. I think it helps show why our location is ideal for coworking space and where people are looking for high community connectivity.